The Curtiss R3C-2 Racer was removed from display in the Barron Hilton Pioneers of Flight Gallery for refurbishing. Restoration specialists are examining it inside and out, looking for any signs of deterioration. Much of the work involves removing many years worth of dust that accumulated in inaccessible areas of the aircraft. The airplane was first preserved in the 1960s. 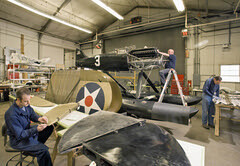 In this photo, from left to right, Tony Carp examines and removes aged and deteriorating fabric from the control surfaces, which will be replaced; Rob Mawhinney uses a bore scope to photograph the inside of the engine, which will later be treated to make sure it is being preserved as well as possible; and Ed Mautner is cleaning and polishing the flying wires, which had become tarnished. The Curtiss Racer will be returned to the Barron Hilton Pioneers of Flight Gallery, which is currently undergoing redesign, when the gallery reopens in May 2010.